WALO has been successfully applying hydrodemolition for more than 20 years. All tasks related to hydro jetting involve the use of ultra-high water pressure systems and specialized robotic equipment. We can achieve the cleaning of components, the roughening, removal or stripping of any kind of concrete surface. 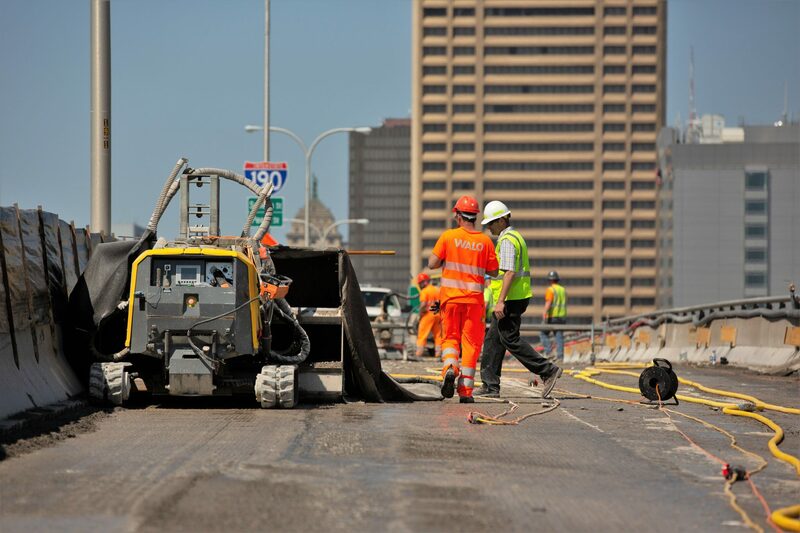 For the repair of all types of infrastructure, including bridges, tunnels or sewage treatment plants. For the customization of newly-built concrete-surface structures. For the cleaning of industrial facilities or incinerators. The uniqueness of this method is best demonstrated in the repair of structures where the existing reinforcement can be exposed without incurring any damage in comparison with other systems which can induce vibration and further impact damage to the structure. A removal robot is one of the best pieces of equipment for delivering success in this highly-demanding field of work. Our experienced and highly-skilled machine operators and mechanics play a crucial role, as they have built up their expertise over many years working on numerous projects. © 2018 WALO US Holdings Inc.
www.walo.com is the official website of WALO US Holdings Inc.